Day 6: It's not a Cavaillé-Coll... but what is it? Today’s excursion was to the laid-back town of Rozay-en-Brie to visit one of the older surviving organs in France. But before describing our adventures, let me say what a pleasure it is to travel with this group of remarkably talented musicians. Even more than playing the instruments myself, I am enjoying listening to these fine students play the French classics and moderns, from the Baroque masters of Marchand and deGrigny, to the Romantics Widor and Vierne, to the finest 20th century composers such as Durufle and Messiaen. Most of our trips from Paris seem to involve an hour of navigating a few short miles to a train station by foot and/or Metro, followed by an hour (plus ou moins) of a very rapid train ride through the suburbs of Paris and the French countryside. Today’s trip was delayed by an hour due to difficulties with ticket machines and lines. Fortunately, our hosts were extremely gracious in accommodating our change and extended our return in the afternoon as well. We were met at the train station by Philippe Lecossais, titular organist of the Grandes Orgues Historiques at Notre Dame de Rozay en Brie (yes, there are quite a few Notre Dames – “Our Lady” - in France), along with his wife and another friend, who chauffeured us the short drive into town. It was a perfect, cool and pleasant June day in this sleepy French locale. Philippe brought sandwiches and cake for an efficient lunch before explaining the remarkable history of the organ. 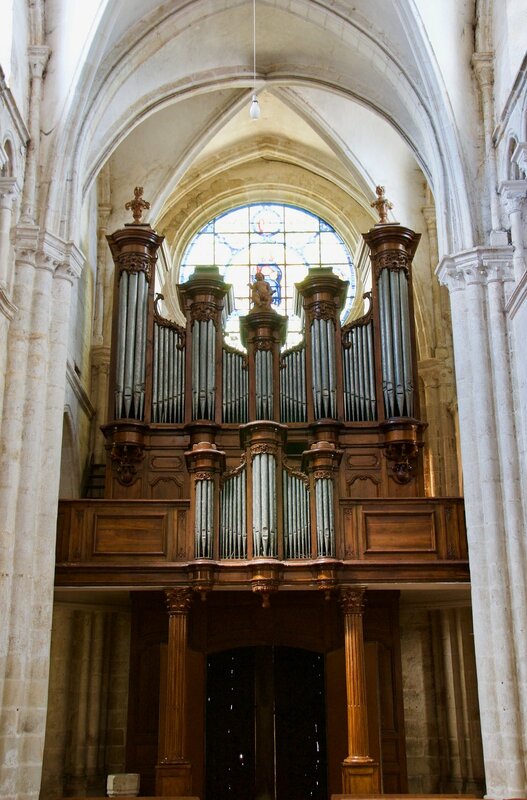 The historic organ of Rozay-en-Brie, which has the oldest keyboards in France. A recent restoration project revealed that nearly all of the current organ was built as a unit between roughly 1670 and 1690. 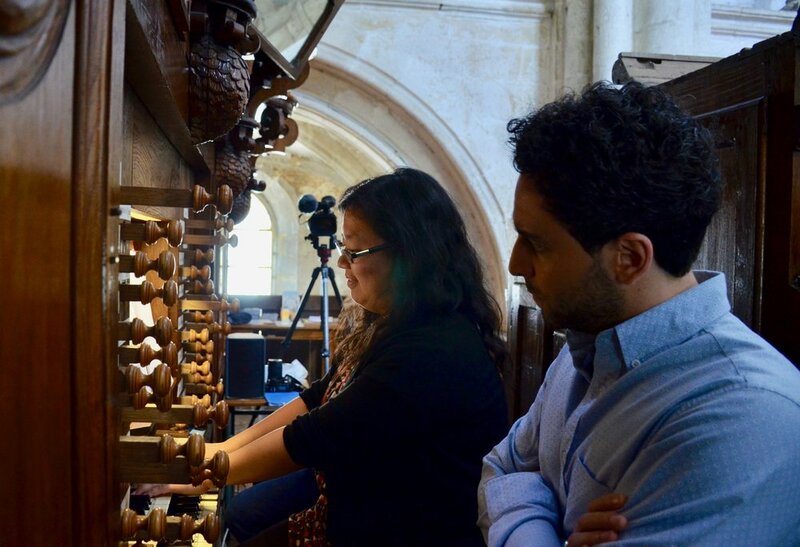 However, pieces of the casing have been dated to 1500, and one even to 1350, showing that this early Baroque organ replaced at least one previous Renaissance era instrument. The names of the organists in 1351 and 1606 are also known. However, the builder of the late-1600’s organ is not known with certainty. The 29-stop instrument is large considering the size of the town. The reason is that the area around Rozay-en-Brie did not belong to the King of France, but rather to the Bishop of Notre Dame de Paris, who directed proceeds of entry taxes to the building and maintenance of the organ. Jennifer Hsiao plays the organ at Rozay-en-Brie. Chris Porter plays the instrument at Rozay-en-Brie. After hearing this remarkable story we pulled out our deGrigny, Marchand, and François Couperin to appreciate the unique sounds of the organ’s stops, which included a lovely, round, full-bodied cromhorne that dates from 1600. We also appreciated the oldest surviving key desk in France, with the very same keyboards played by Nivers and, most likely, Couperin (the family lived 10 miles away) with its light, responsive action. The old-style pedalboard discouraged complex pedaling technique; a missing low C-sharp on the keyboard, while throwing us off at first, made the large intervals in deGrigny’s Kyrie easier to manage. The Boston Organ Studio enjoys a lovely dinner with their guest, Jeremy Jelinek. We had plenty of time to play through our repertoire before catching the 5:00 return train to enjoy our last night in Ile-de-Paris, which included a home-cooked meal of fish and chicken, French wine, and much conversation and laughter. The infamous Crayon stop -- for a pencil!! Jennifer plays the organ at Rozay-en-Brie! Corey de Tar plays the organ at Rozay-en-Brie! Corey de Tar playing the organ at Rozay-en-Brie! Chris Porter playing the organ at Rozay-en-Brie! Brandon Santini playing the organ at Rozay-en-Brie! The pedal board of the French Classical organ at Rozay-en-Brie! Noel listening to the rich 8' foundations of the organ at Rozay-en-Brie! The Boston Organ Studio with the titular organist, Philippe Lecossais at Rozay-en-Brie! The Boston Organ Studio enjoying a lovely meal following their visit to Rozay-en-Brie!